And thar she blows – my version in two shades of linen. I cut a size 42. I added an inch to the arm length and cut the shoulders in a bit. 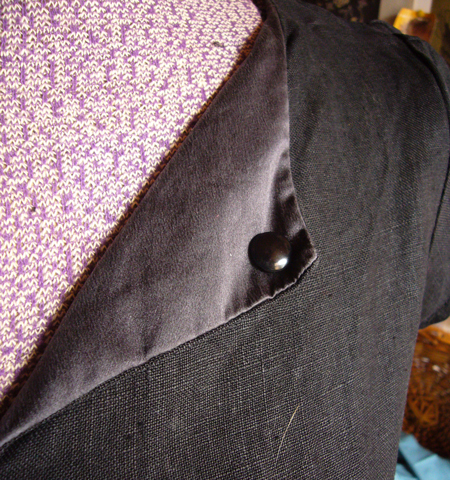 Oh, and bound buttonholes? Pffffft. 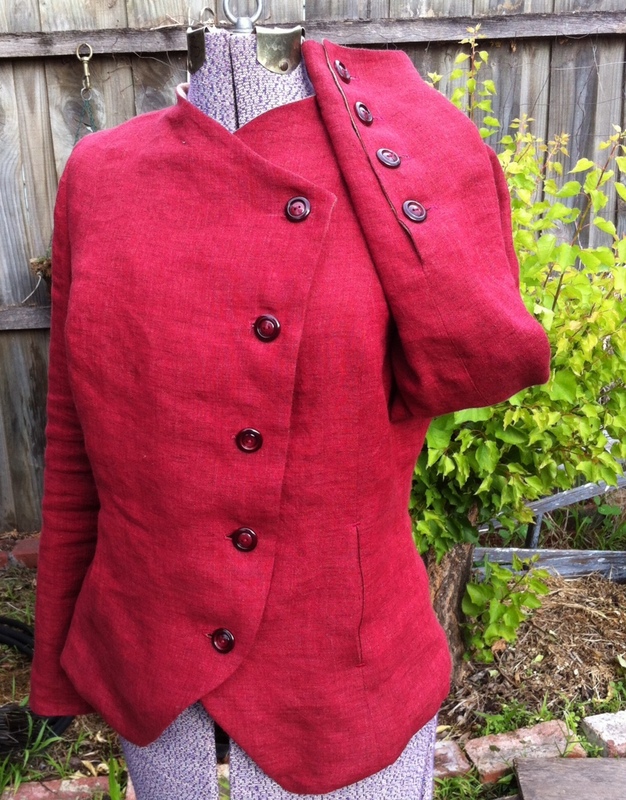 Blazer in red linen with dusty pink linen cuffs and collar. 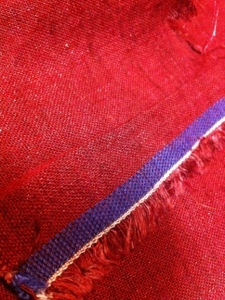 Close up of the lovely linen. I reinforced the pocked edges with little bursts of satin stitch. 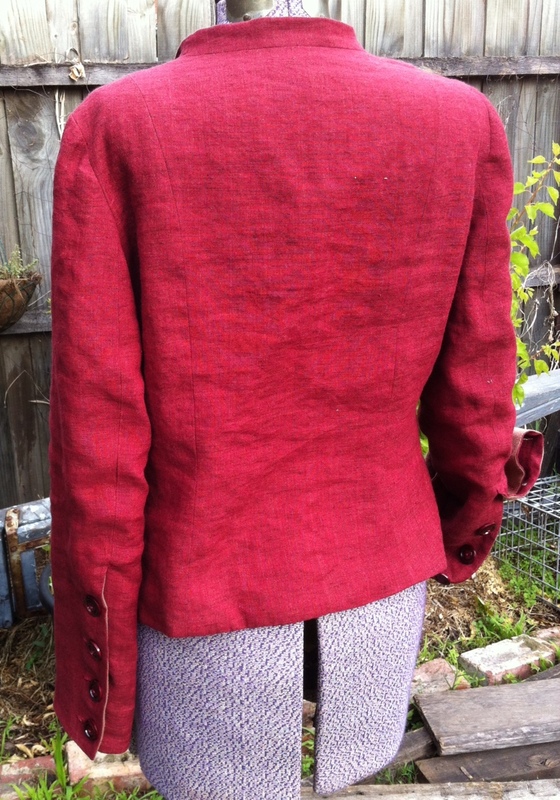 All buttoned up is a little severe but will be excellent for draft-stopping as the weather gets colder. I may have forgiven linen for its earlier transgressions. This red stuff is lovely. I like its flop and its crumple. Always glad to use up some of my Buttonmania buttons. These are splendid. The lining – polished cotton that once lined a bedspread – is so soft. Heavy but cosy. Extra long arms are terrific! I think a few design details lose the right proportion when graded up. Perhaps it would have been better with an extra button. 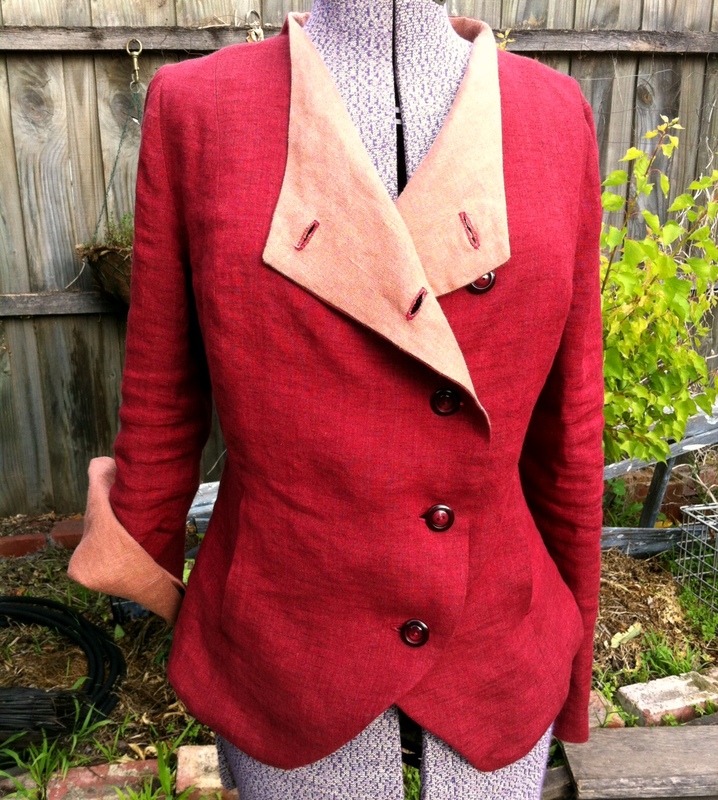 And compare the angle on the lapel – did it stretch as I sewed? I’d curve it in at the waist more next time. It’s bloody tricky to find the spot for the button second from the top! 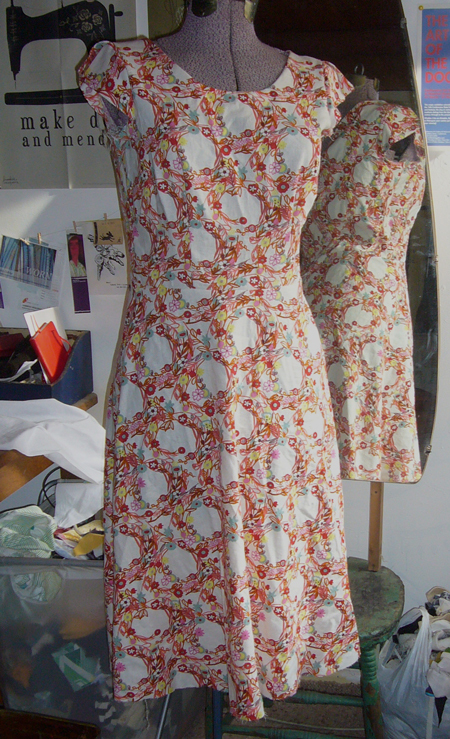 Outer fabric all cut out. Look at this deeeelicious colour! The puny pockets need embiggenment. Here’s my redraft to blow out the pockets to a more useful size. 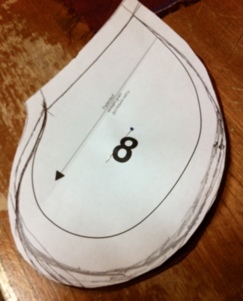 I’m a little stumped on the lining, though. It will be visible on the collar and cuffs and I’m reluctant to use a patterned lining because it limits what I can wear it with. So – to the stash! Which would you use? Or should I keep stashfishing? 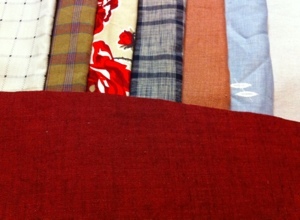 L-R: shirting, linen, cotton, cotton, linen, linen, raw silk. update: Here are more options. Yes, my stash is capacious. 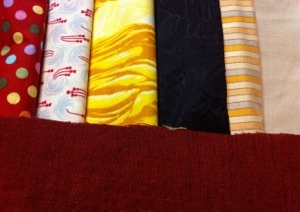 L-R: cotton print, quilting cotton, polished cotton, embossed silk, shirting stripe, rayon. You’re awful purdy in plant form. Your seeds make tasty bread topping, or, when crushed, useful (and excitingly self-combustible) oil for the handles of my garden tools and as a vehicle for the pigments of my oil paints. 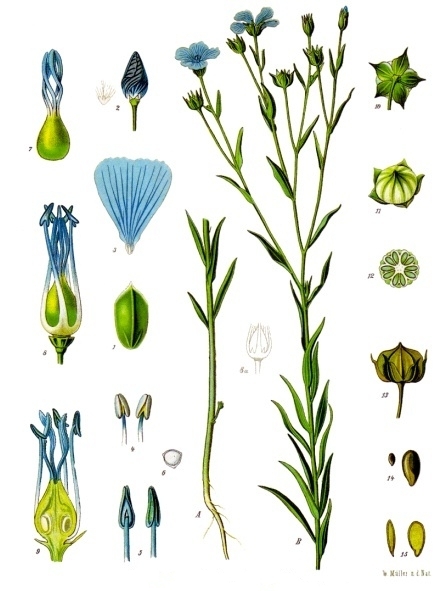 Along with quinine-laced tonic and an astonishing sense of entitlement, you helped Europeans look cool and stay cool while they colonised hot and sticky places. Your fibres have wrapped mummies, supported great works of art, and dried tears from countless faces. Rich people sleep on sheets made from you. Printed with novelty patterns, you’ve dried many a dish (and flicked many a bare-leg-of-annoying-sibling. YEOUCH!!) You’re famous for being durable and long-lasting. AND YET, I narrow my eyes at you, Linen, because in garment form, you’ve been nothing but a disappointment to me. The wrinkling I can live with because my persona is naturally a bit crumpled. But you have proved far less resilient than promised and garments made from you have torn in embarassing places, in embarassing moments. To wit: the loose black linen pants that made me super happy for about a week as I swanned about feeling quite the breezy thing, until two gaping tears appeared in the area most familiar with my bicycle seat. Then there was this dress. Lint-free? My arse. Every time I wear this dress I am covered in tiny bits of linen stubble. It embeds in my layer of sunscreen and makes me look grubby and unwashed. Long-lived? PAH! I’ve sewn up and patched the skirt vent three times and this morning it tore again. And inexplicable pea-sized holes appeared in the side of the skirt too. And laundering has turned it from lightweight to uncomfortably sheer. Did I do something wrong, Linen? 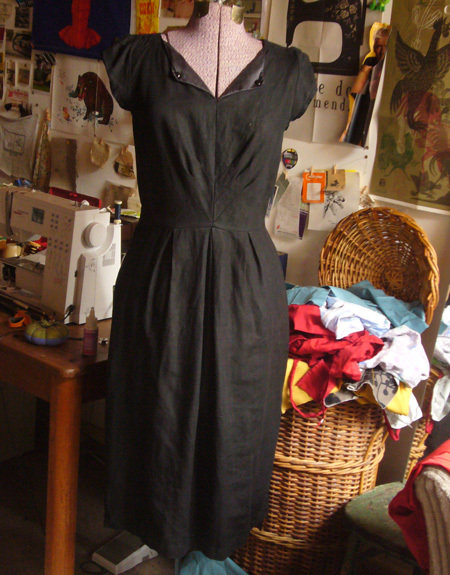 I recall this black dress took a few washes not to reek of cheap dye – could it be that the dye weakened your fibres? Or were these not your finest fibres to start with? Maybe I should just leave you to those who understand you, like Steph C, Or do some book-learnin’ to catch up. But right now, I’m not sure I can trust you again. 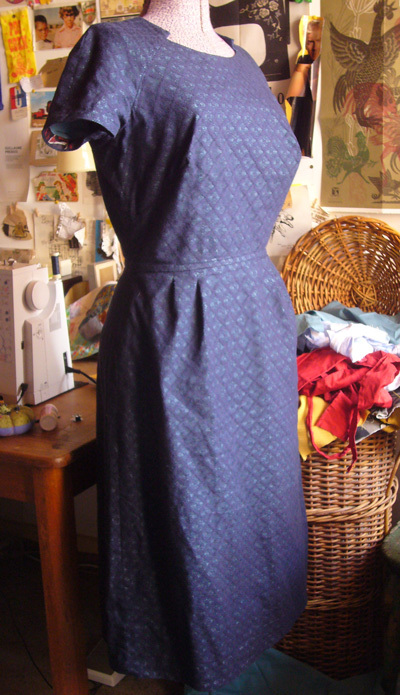 Continuing on the recent project round-up, we have some frocks to discuss. Two are awesome. One is not. Let’s start on a high, shall we? Ages ago I made a notch-necked sheath from loud corduroy. It became my favourite of all dresses. I love it the best. I wanted to make it again so when I hit the Fabric Store‘s 40% sale, I went in looking for sheathables. Not usually a lover of lace (chantilly, no matter how expensive, looks like nasty trash to me. I also think diamonds are shabby. Perhaps my X chromosomes are defective) I found a geometric lace that didn’t give me the shudders. Off we go then! 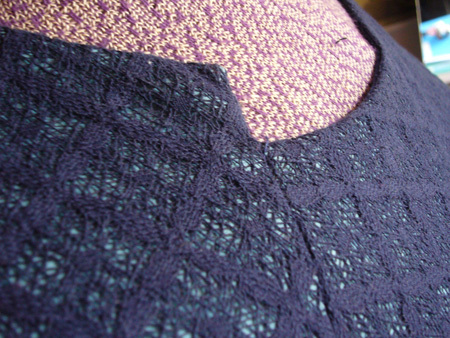 I interlined it in a turquoise blue stretch cotton woven and went to town. I even got the neck notches right this time. Look at those buenos notches. I made this twice but I’ll spare you a look a the second one because it was a costume made in nasty stretch silver for a space-themed gathering. 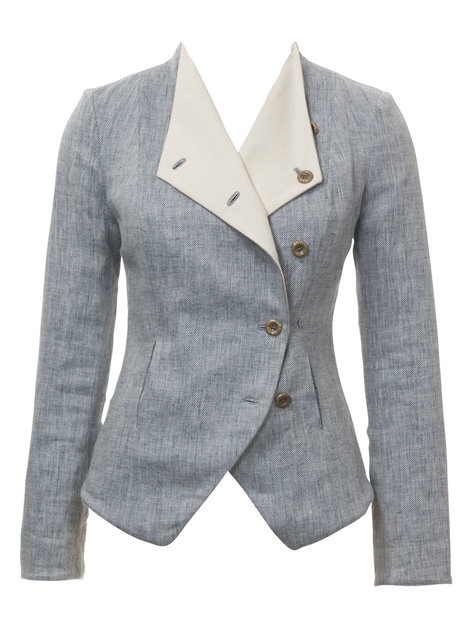 This one is much classier… so classy that the first time I wore it, I didn’t feel like myself. It was too tasteful. 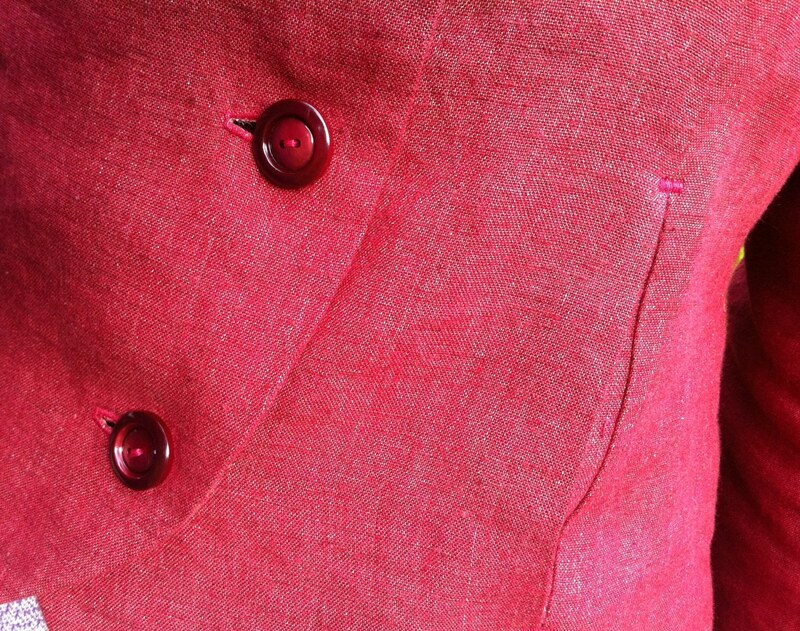 The little turned over collar and buttons are pretty dandy. The linen was an op shop score yeeeeears ago. It reeked of cheap dye and stained my yellow cardie on its first wear. Four or five washes later it doesn’t smell but I will be sniffing every bit of fabric from now on. If it has the stink, it’s not welcome in the stash. Last weekend I dragged Moggy (kicking and screaming, as you can imagine) to the Rathdowne Remnants yard sale. (We got $1/m cream merino jersey. We win.) She was wearing a becomming frock so I borrowed the pattern when I dropped her off and went home to make it, thinking it would be ideal for my impending USA trip. I’ve had this green wool jersey in the stash for years (I think it was a v. cheap Darn Cheap score because it had a fault or two in it) so schnip schnip, I cut it out. It looks like a dressing gown on me. The solid colour is blah. 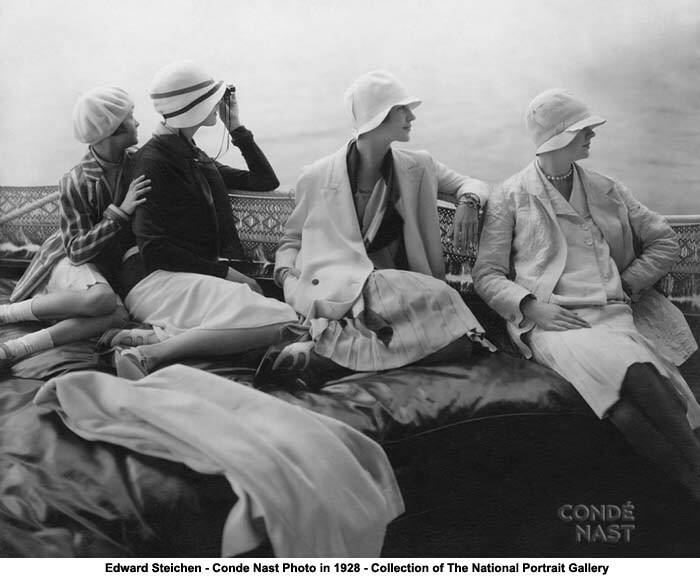 The fit is for the slender of hip not the ample of pelvis. It’s just naff. It remains unfinished. What’s the point? Maybe jersey dresses are never going to be my thing. I’ve tried a few and they’ve never lasted long. Green jersey dress fail. Headless Esme doesn't fill it out right but it doesn't look much better on me. Bummer. PHEW! Now I’m up to date. Clearly it’s time to start something new. More good travel clothes, methinks. 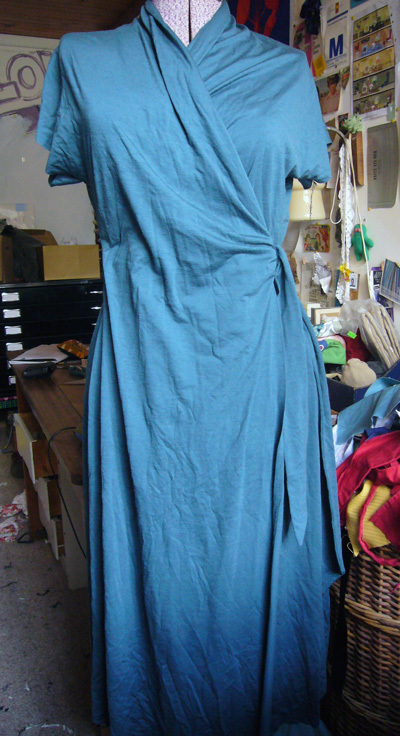 Sadly when I cut down the neckline a bit, my feeble narrow shoulders let me down and it’s too big around the shoulders. So I have to rip out the zipper and take a bit out of the back centre seam. Booooooooring. So, she stalls. Fabric is linen or linen/cotton blend I got for $2/m years and years ago. I haven’t used it because I thought it might be a bit flowery and girly. It kinda is. But with a rainy weekend forecast, I’ll see if I can finish it up in the next couple of days.